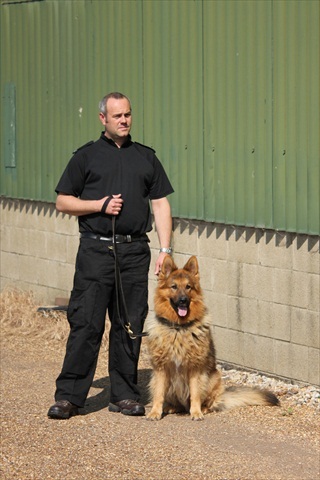 Protocol and Canine has brought together a team of professionals who are all expert in their respective fields, and who share the same philosophy; to create a Canine Security company that has already become the chosen provider of Security Services to a number of prestigious clients including Anglian Water, and British Sugar PLC. Our ethos is not only to provide you with operatives whose training enables them to meet and exceed the exacting standards you require, but also to understand each of our client’s needs and provide a service that fits seamlessly around their business. The Team consists of several breeds of canine depending on the type of service the client has requested. Protocol and Canine generally will use a German Shepherd while on location. Originally bred for their intelligence and working ability the German Shepherd is well known for working with the Police and Military for tracking criminals, patrolling troubled areas and as rescue dogs. Being highly obedient and curious are traits of the German Shepherd which make them such great guard dogs. The Malinois is also used by Protocol and Canine on occasions; another highly intelligent canine which is bred specifically as a working dog. The Malinois is very friendly and hardworking, they tend to exhibit incredibly high energy levels and we have seen them jump great heights, clearing walls and fences around 7 feet high! These dogs are extensively used by the Military for detection, personal protection and rescue. Traditionally used for flushing and retrieving game, the Springer Spaniel is widely recognised as a very intelligent and hard working canine. Protocol and Canine uses the Springer Spaniel specifically for drug and bed bug detection. The Spaniel’s friendly demeanor and appearance prevents them from being intimidating and they are great dogs to have around. This said their powerful sense of smell enables them to uncover anything from narcotics to mobile phones. One of the most popular breed of dogs in the world, the Labrador is very intelligent, athletic and hardworking. Similarly to the Spaniels, Protocol and Canine uses Labradors in the fields of detection and recovery. Their mild manner makes them ideal to bring into a company or residence and work non-disruptively.